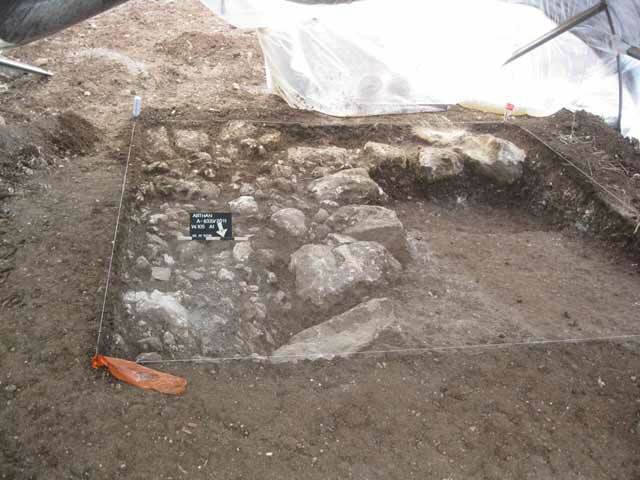 During November 2011, a salvage excavation was conducted in the Ibthan village (Permit No. A-6329; map ref. 204865–99/697010–37), prior to construction. 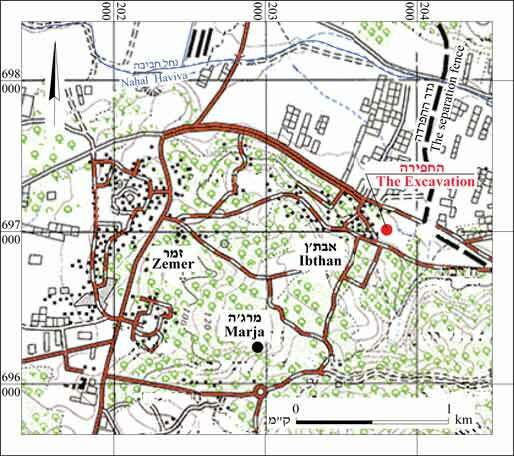 The excavation, undertaken on behalf of the Israel Antiquities Authority and underwritten by Z. Mamoun, was directed by D. Masarwa (surveying and field photography), with the assistance of H. Ben-Ari (GPS), A. Gorzalczany (consultation), I. Berin (final plan) and M. Shuiskaya (pottery drawing). 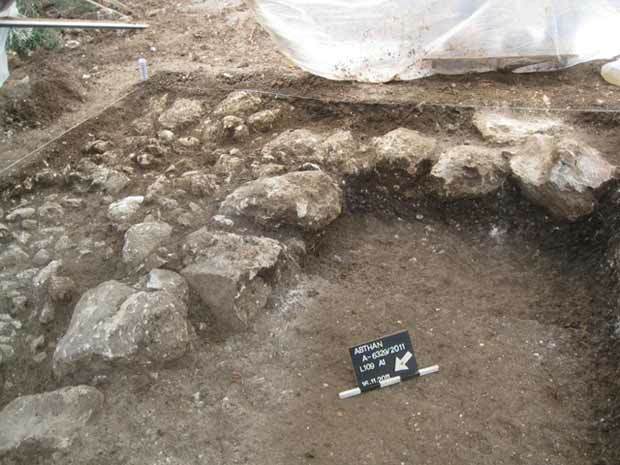 The excavation was carried out on leveled ground in an olive grove northeast of Tel Ibthan (Fig. 1). The tell is located on a hill in the eastern Sharon, southeast of the sites Khirbat Yamma, Tel Jatt and Tel Zeror. To date, only small-scale excavations have been conducted on Tel Ibthan (HA-ESI 118; HA-ESI 122; HA-ESI 123; HA-ESI 123; HA-ESI 123). Two squares (A1, A2; Fig. 2) were opened; mechanical equipment removed the top layers until ancient remains were reached at a depth of 0.1 m below the surface. Wall remains of a building and a section of an alley east of the building were exposed, dating to the Hellenistic–Late Roman periods. Fill (L102, L103) consisting of small and medium-sized fieldstones was exposed in the two squares. It was delimited on the west by massive walls (W104, W106; length 3.9 m, width 0.7 m) of a building and apparently continued east beyond the excavation squares (Fig. 3). Due to the limits of the excavation, that part of the fill was not revealed. The walls were built of one row of medium and large fieldstones. They were apparently two sections of the same wall, which were adjoined by two walls that formed two corners of a building: at the southern end of W104 (W105; length 2 m, width 0.5 m; Fig. 4) and at the northern end of W106 (W107; length 2.5 m, width 0.5 m). The walls were built of medium and large fieldstones; they were aligned east–west and continued westward beyond the excavation squares. Due to the limits of the excavation, the rest of the building was not exposed. The ceramic finds discovered in the building included jars (Fig. 5:1, 2) from the Hellenistic period; bowls (Fig. 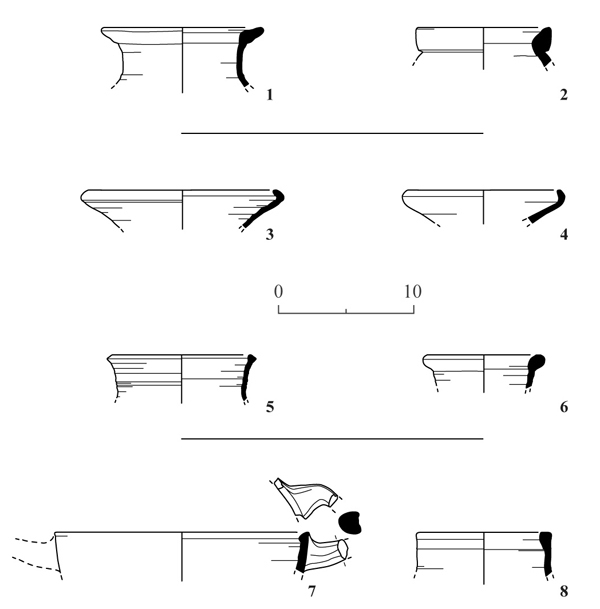 5:3, 4), a cooking pot (Fig. 5:5) and a jug (Fig. 5:6) from the Early Roman period, and a casserole (Fig. 5:7) and a baggy-shaped jar (Fig. 5:8) from the Late Roman period. Massive walls that formed two corners of a building were exposed in the excavation. Presumably, these were some of the remains of a settlement that likely existed at the site from the Hellenistic to the Late Roman periods. In addition, small and medium fieldstone fill that abutted the outside of the building’s eastern wall was revealed. It was probably an alley similar to those exposed in previous excavations (HA-ESI 123; HA-ESI 123). The dating of the finds is consistent with that of the finds exposed in previous excavations at the site. 3. An alley adjoining the eastern wall of the building, looking south. 4. The southern corner of the building, looking southeast.